My nephew Liam has always been what you might call an old soul. He is as comfortable with my friends as he is with his own, speaks multiple languages, practices the piano without argument, and actually gets along with his parents. It&apos;s easy to forget how young he is sometimes. But if there is one thing that truly brings out the 11-year-old in him, it&apos;s roller coasters. While most kids his age dream of being baseball players or firemen, Liam has always wanted to be an architect. More specifically, one who designs roller coasters. This kid is so obsessed that he used to call me whenever he grew an inch to tell me he was that much closer to the minimum height required to ride the big coasters. 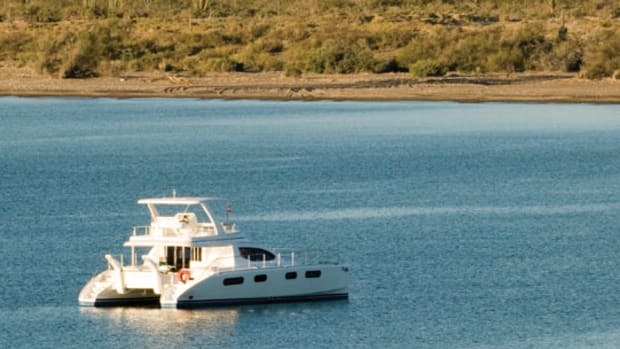 So when Meridian Yachts offered me access to one of its boats near Sandusky, Ohio, I called Liam at his home in Nevada to see if he wanted to go for a boat ride. 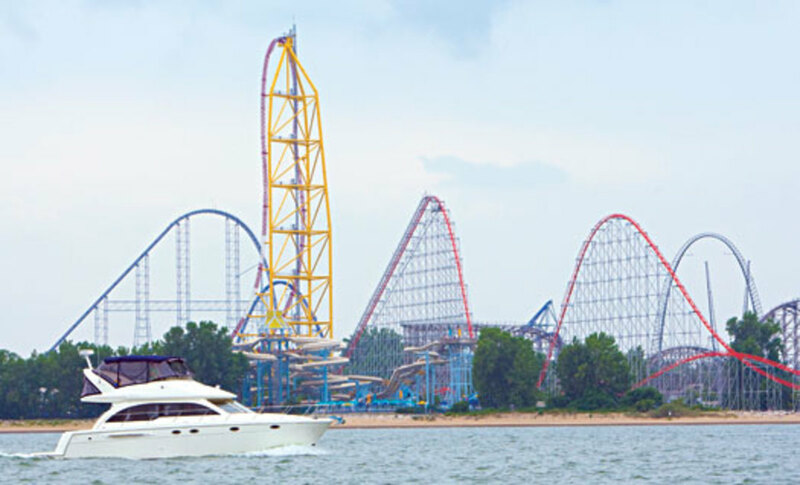 You see, Sandusky is home to Cedar Point, which currently holds the world record for most roller coasters (17) and has been voted "Best Amusement Park in the World" by Amusement Today for ten consecutive years. But there is more to Lake Erie than barrel rolls and double loops, so I made an appointment to meet with Bob Lusardi, the MarineMax dealer in Port Clinton, Ohio, to pick up some local cruising knowledge. Lusardi moved to Ohio after having lived in southern New Jersey and Florida. 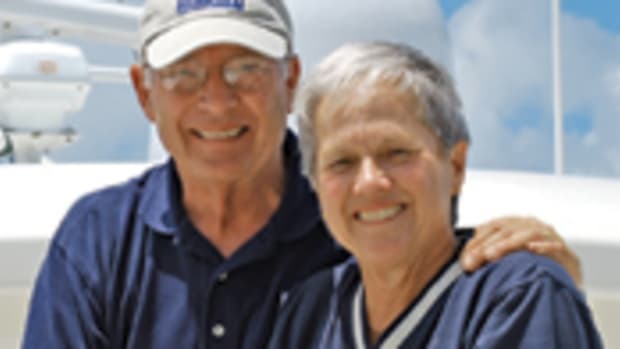 He grew up boating on Barnegat Bay, the Florida coast, and the Chesapeake, but he claims that Lake Erie has the best boating "east of the Mississippi." 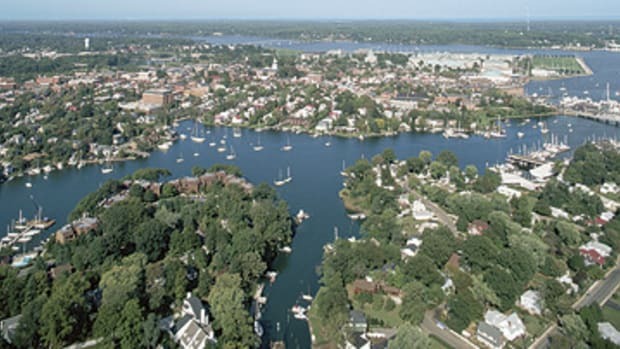 The reason, he explains, is the abundance of transient dockage available and so many great cruising destinations in such close proximity: the Erie Islands, the Detroit River, Lake St. Clair, Toledo, Sandusky, and more. 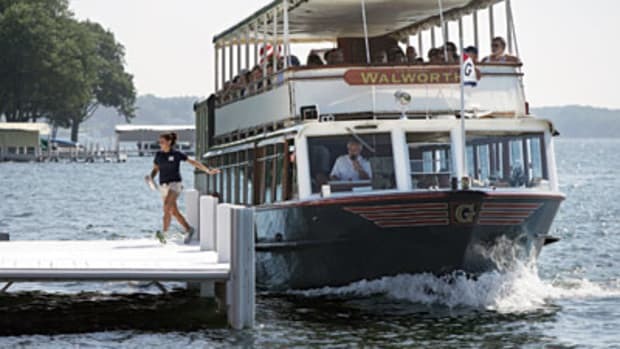 With only three days to get a taste of the local cruising scene, Lusardi set me up aboard the Meridian 411 and pointed me in the direction of Put-in-Bay on South Bass Island, a seven-mile jaunt from Port Clinton harbor. Just 30 minutes later we arrived at The Crew&apos;s Nest, a private club where Lusardi had kindly reserved a slip for us. Unfortunately we&apos;d missed the town&apos;s Christmas in July celebration by a day, but we did get a chance to meet the guest of honor, as the dockhand who helped us tie up played Santa during the festivities (all 140 pounds of him). Lusardi warned us before departing that Put-in-Bay once had a reputation as a "frat party for adults" but said it had toned down quite a bit. We decided to rent golf carts from The Crow&apos;s Nest to explore the town and find out for ourselves. The first stop on our tour was the Heineman Winery & Crystal Cave, which seemed like an odd combination, but we were falsely encouraged by the dozens of other golf carts lined up in the parking lot. The crystal-cave tour consisted of one poorly lit viewing room that was barely large enough for a group of ten. Fortunately it was over in a matter of minutes, and we were on to the winery tour, which was much more entertaining—mostly because our tour guide answered visitors&apos; questions about the fermentation process by saying, "I don&apos;t know. They only let me give tours and sell wine." The winery tour was followed by a tasting, where we unanimously voted Liam&apos;s grape juice the best—it was delicious—before continuing to explore Put-in-Bay. After swinging by the minigolf course and the chocolate shop, we visited the Perry Victory and International Peace Memorial, a 352-foot tower dedicated to the soldiers who fought in the Battle of Lake Erie during the War of 1812, particularly master commandant Oliver Hazard Perry. It also celebrates the long-lasting peace among the United States, Britain, and Canada—a sentiment particularly important to local residents, as the Canadian border lies just five miles to the north. 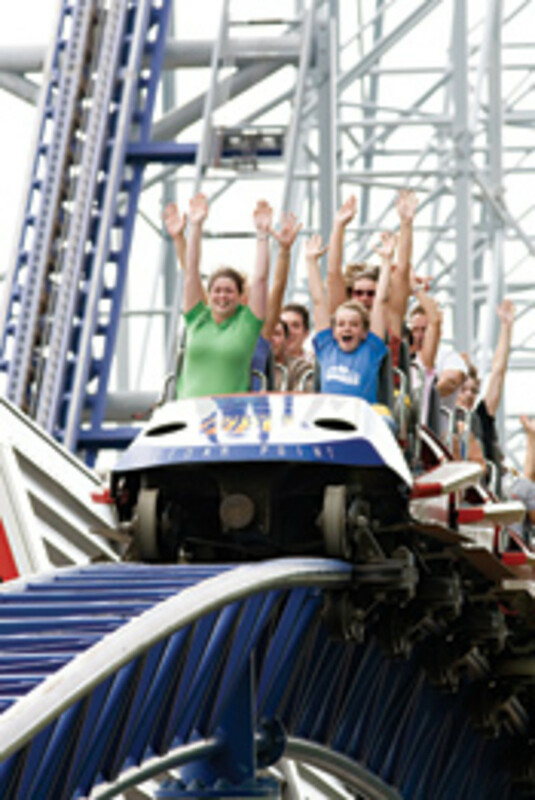 The author and her nephew descend from one of Cedar Point&apos;s 17 roller coasters. On our way back through town, we caught a glimpse of the nightlife Lusardi had referred to as we passed the bars and restaurants lining Delaware Avenue. As the crowds gathered outside Mr. Ed&apos;s Tiki Bar and bands carried their equipment into the Roundhouse Bar, we decided to try the local fare at the Boardwalk restaurant that overlooks the harbor. Unfortunately it was closed for a private party, so we took our chances at a sidewalk table back in town. While my parents may have missed out on the local Lake Erie perch and fresh Maine lobster at the Boardwalk, Liam was more than content chowing down on corn dogs and mozzarella sticks at the Boathouse Bar and Grill as a band named Lieutenant Dan&apos;s New Legs played next door. Rain eventually put an end to our evening, and we headed back to the boat to get an early start the next day. The plan was to spend it on nearby Kelleys Island before heading to Sandusky that night. Although Liam was dying to get to the amusement park, the adults were looking forward to a relaxing day of bicycling and bird waching. Located five miles southeast of South Bass Island, Kelleys Island measures about four square miles—676 acres of which is state park land. It has also been designated an Important Bird Area by the Audobon Society of Ohio, so preservation is the name of the game. As Joe, back at the Anchors Away Marina near Port Clinton, told us, "Everything is protected on Kelleys Island. Even the snakes." Unfortunately the rain hadn&apos;t let up, so we never got a chance to explore Kelleys&apos; nature trails, lime kiln ruins, and rare glacial grooves left behind by the Wisconsinan glacier 30,000 years ago. Instead we continued on to Sandusky with Liam in a state of complete panic, wondering if any of Cedar Point&apos;s roller coasters would still operate in the rain. We prayed the weather would clear up enough the next day to put the wind back in Liam&apos;s sails. If not, we were in for a long and disappointing day. The mood picked up a bit as we entered the Upper Straight Channel, which led us along the western edge of the amusement park. The roller coasters were so close, we felt like we could reach out and touch them. As we turned into the Cedar Point Marina, I was the one who couldn&apos;t believe my eyes: more than 700 slips (including 100 for transients), a fuel station, two restaurants, a picnic area, and even a swimming pool. We were nearly eight hours early, so I decided to fuel up and let the marina office know we had arrived. Fortunately, despite our early arrival, they were accommodating and immediately assigned me a slip. While backing the Meridian into it, I could see Liam sitting in the cockpit staring at the Millenium Force, which soared above the tree tops, almost willing it to run. The amusement-park gods must have smiled upon us, because an hour after we settled into our slip, the rain started to break and the sun began peeking out from behind the clouds. 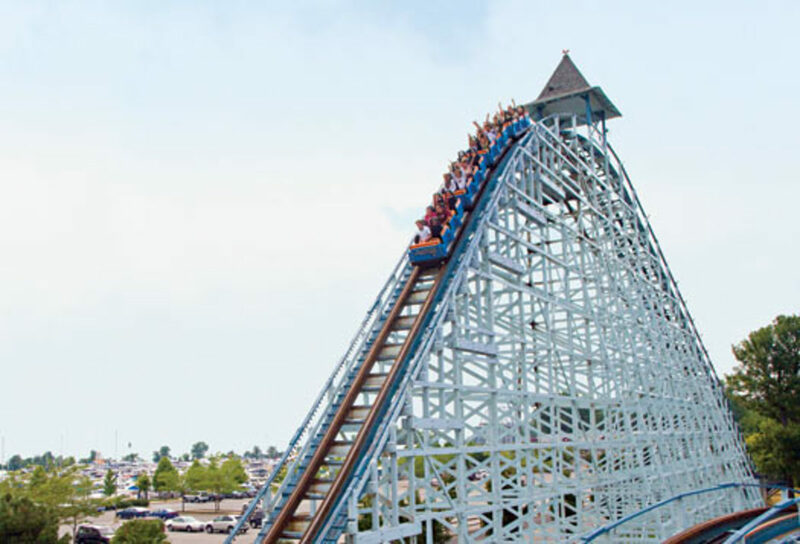 I could see Liam jumping up and down even before I heard the screams from the people onboard Millenium Force as they dropped 310 feet at 93 mph. He was halfway to the park entrance as I locked up the saloon door. According to Liam, things couldn&apos;t have worked out more perfectly. The park is on a peninsula, so in addition to the thrills, you get beautiful views of the lake from the top of the rides. We were even able to spot the Meridian docked in the marina from the top of the 78-foot-tall foot hill on Blue Streak, a 41-year-old wooden coaster. As with any amusement park in the summertime, lines for the rides were long, but the patient and polite Midwestern crowd made it bearable and, at times, even enjoyable. The next day we were given a tour of the facilities—which also include a sandy beach, two water parks, and several hotels—and the rides by the park&apos;s director of public relations, who quickly became Liam&apos;s hero. An adult who knew the rides&apos; height and speed stats better than he did? Amazing! We were even treated to front-row seats aboard Top Thrill Dragster, the tallest and fastest roller coaster on Earth—we&apos;re talkin&apos; a 420-foot climb straight up in the air at 120 mph. My father wisely chose to sit that one out and enjoy some quiet time aboard the Meridian, but my mother was right behind us with her hands in the air. That evening, while sitting down for dinner at Famous Dave&apos;s Bar-B-Que in the marina, Liam excitedly reviewed our adventure at length. "I&apos;d say this trip was a home run," my father summarized. "No," Liam clarified. "It was a grand slam!" 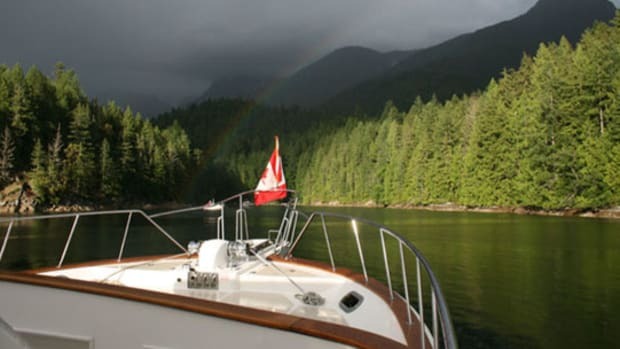 For more information on Meridian Yachts, including contact information, click here. Although the 341 and 391 are the most popular boats in the Meridian fleet here, Bob Lusardi thinks a 40-footer is the perfect size for a family cruising Lake Erie. 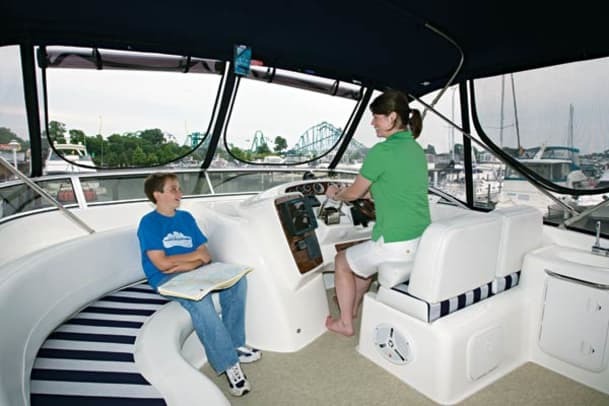 The 411 comfortably sleeps six, with master and guest staterooms and a convertible dinette. We spent most of our time on the spacious flying bridge, where we stayed dry through the rain storms thanks to the optional enclosure. 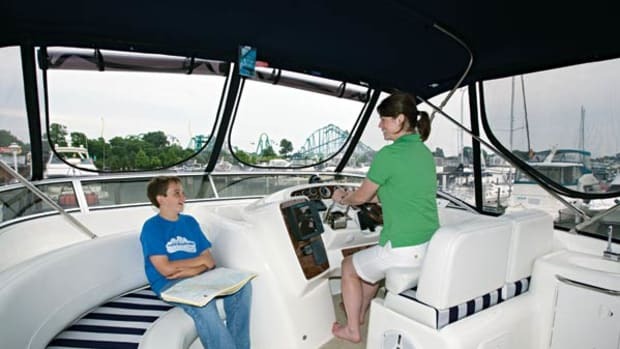 With a smooth ride, great sightlines from the helm, and the Docking on Command system, I was able to handle the boat easily myself, with a little line-handling assistance from the crew. After having spent a long weekend aboard, I wholeheartedly agree with Lusardi. The 411 is perfect for a cruising family—no matter where in the country you are.—E.M.